This is my semi-famous mac and cheese recipe. It is so good, that my grandma begs me to make it anytime I’m home from school (ironic right?). It’s also a great dish for potlucks because it’s a little bit different than your typical mac and cheese so even if someone else brings macaroni and cheese, your dish will be unique. The best part about this mac is the crispy cheese crust it forms, just pure yummy! Step 1: Boil Macaroni for 8 minutes then lay into casserole dish. I like to use a dish with lots of surface area, because that means more crispy toppings! 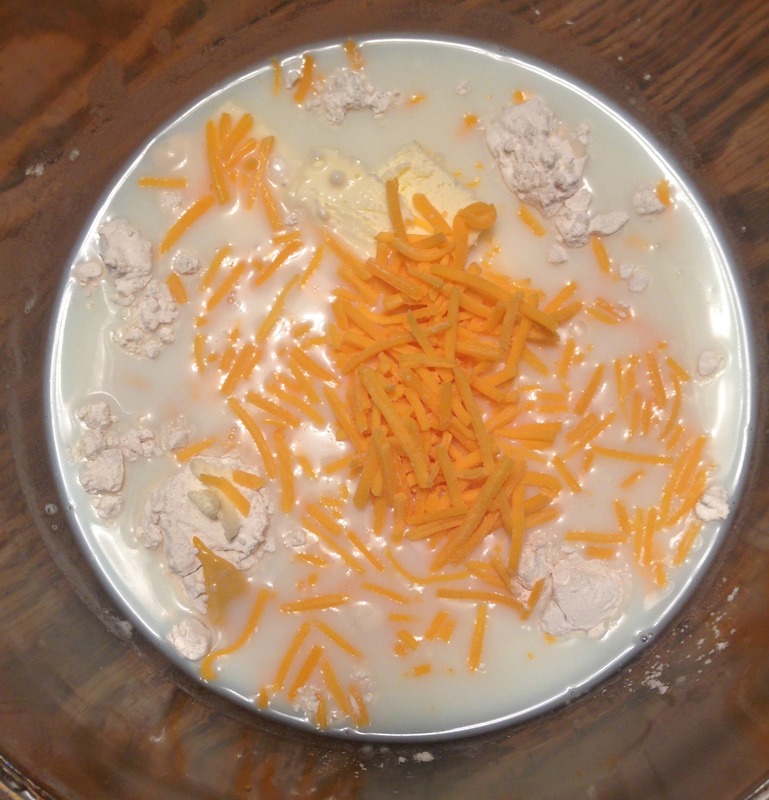 Step 2: Combine milk, flour, butter, mustard, salt and half of the grated cheese into a microwavable bowl. Microwave for 1 ½ minutes, stir, then microwave for another 1 ½ minutes and stir. If the butter is not fully melted, microwave for one more minute. It should end up looking like the picture to the right below. Step 3: Pour mixture over macaroni, stir to mix cheese in, and then cover with the additional cheese. Sprinkle pepper and paprika on casserole and bake at 375° for 40 minutes. Preheat over to 375°. 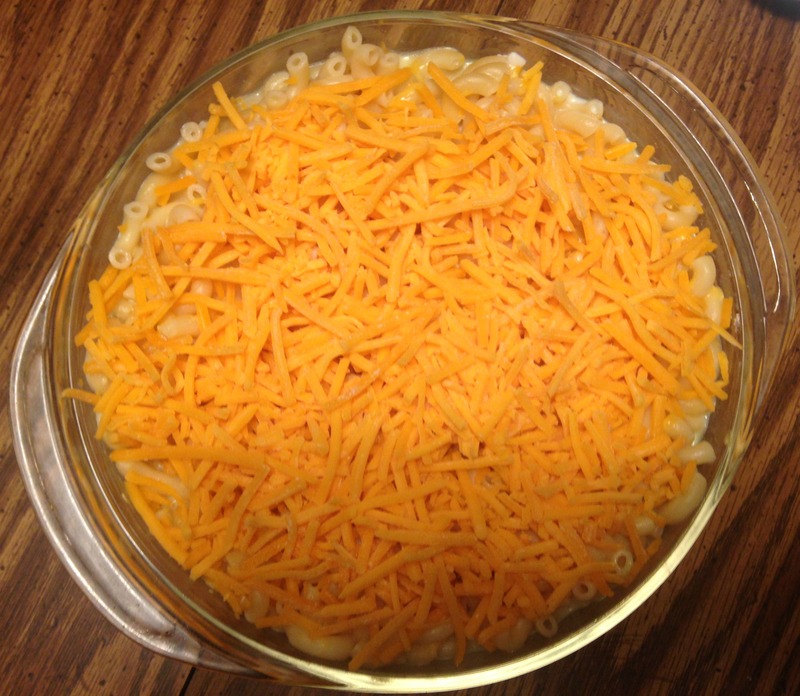 Boil macaroni for 8 minutes, drain, and place in casserole dish. In a microwavable bowl, combine the milk, flour, butter, mustard, salt, and half of the grated cheddar cheese. Microwave for 3 minutes, stirring in the middle. If the butter has not fully melted, microwave for an additional minute. Pour this mixture onto the macaroni and then mix in. Coat the macaroni in the remaining cheese. Sprinkle with pepper and paprika and bake for 40 minutes. My husband and I love mozzarella, but it’s so expensive to buy in stores. I kept on finding make your own mozzarella recipes on Pinterest, but I wasn’t daring enough to try one out completely blind. However, I was definitely intrigued. 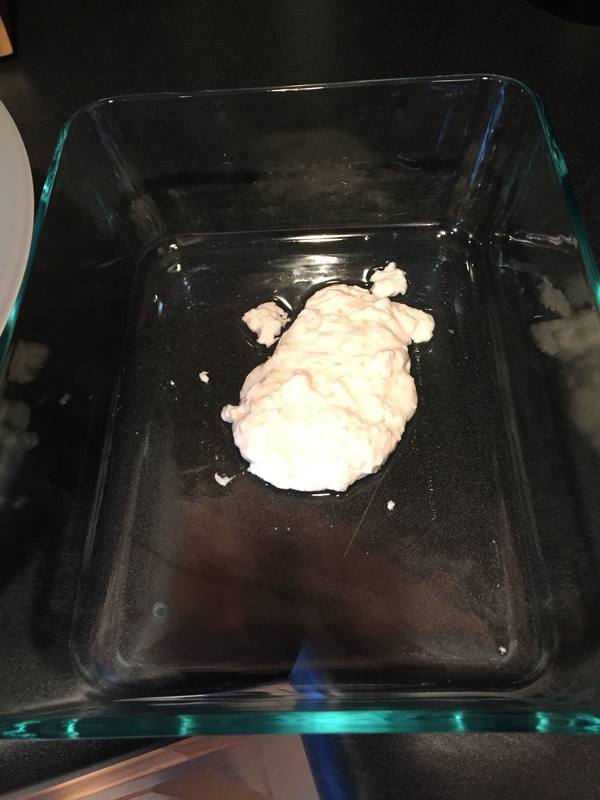 So, I decided to try Ricki’s Mozzarella and Ricotta Kit. It came with basically everything I needed, so I wasn’t worried about buying the wrong ingredients. 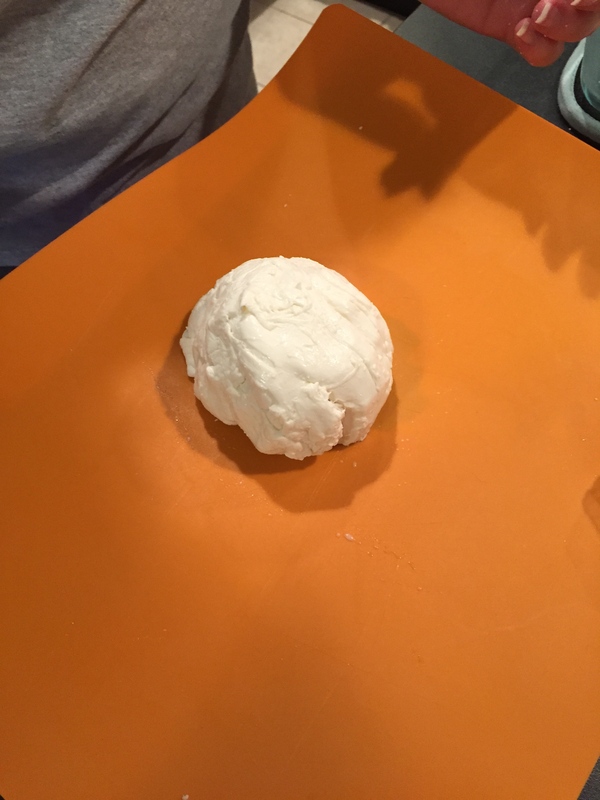 And, if it worked, it came out to about $4.50 per pound of mozzarella. I’d say that was a pretty good deal! I was a little worried about how hard it would be to find pasteurized (not ultra-pasteurized) milk, but was happy to find that both Aldi and Trader Joe’s brand milk is fine. 1. Dissolve 1/4 of a rennet tab in 1/4 cup of cool chlorine-free water and set aside. 2. Dissolve 1.5 tsp of citric acid in 1 cup off cool chlorine-free water. Add to a big pot. 3. 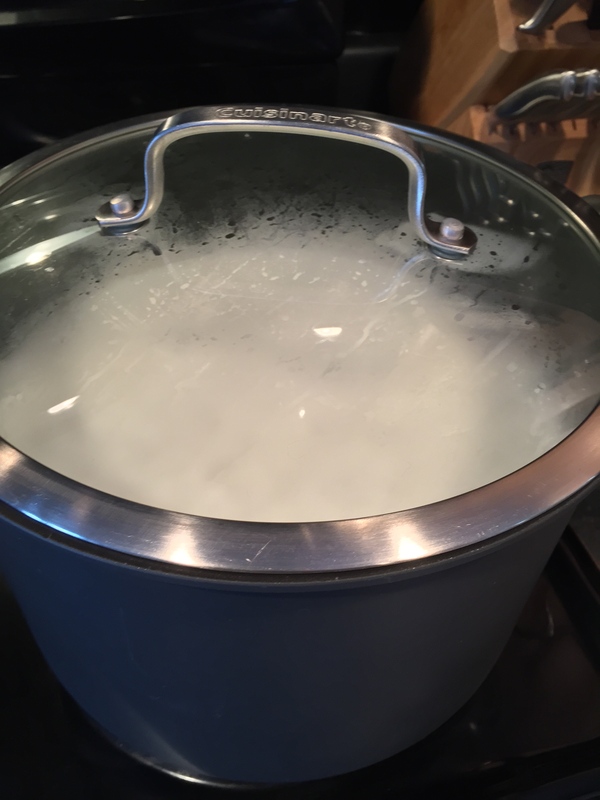 Dump one gallon of whole milk into pot and stir. 4. While stirring constantly, heat mixture to 90°F. The kit came with a dinky alcohol thermometer. If you don’t have any other thermometers, I’m sure it would work fine, but I preferred to use my trusty digital thermometer. 6. 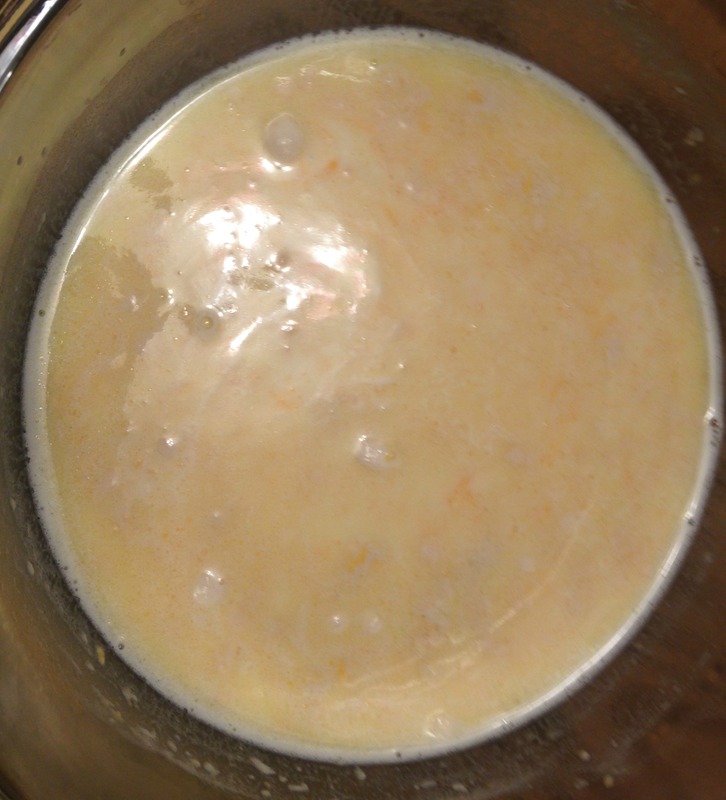 Cover pot and let stand for 5 minutes or until mixture resembles custard (and you can see a clear separation between the whey and the curd). Mine needed way more than 5 minutes. I gave it about 15 minutes. 7. Cut the curds diagonally. It says to use a knife, but there was no way I was using metal in my coated pot, so I used a spatula. 8. 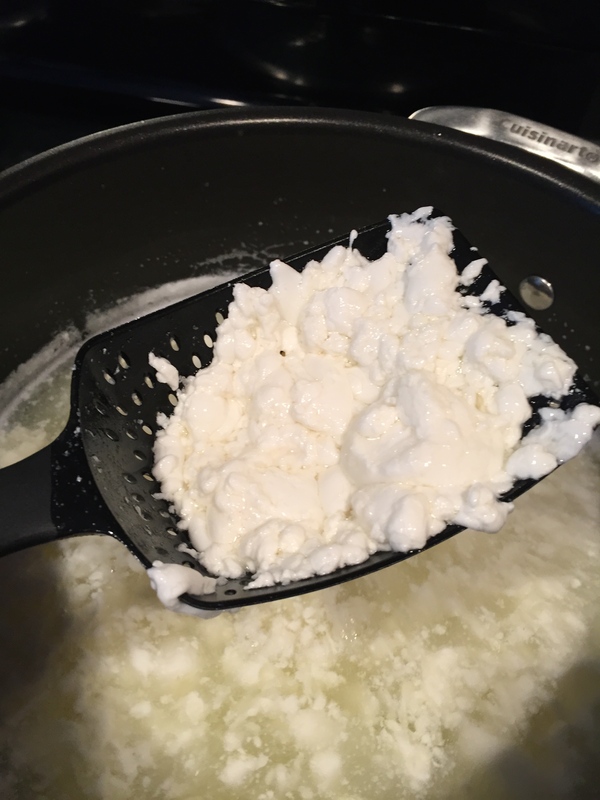 Place pot back on the burner and heat to 105°F while slowly moving the curds around with a spoon. 9. Remove from heat and stir for 3-5 minutes. 10. 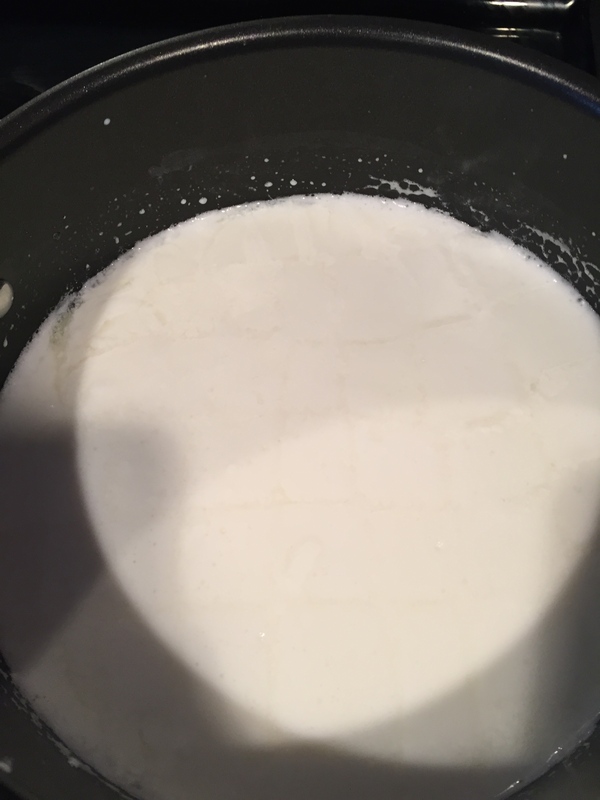 Scoop out curds and strain off whey. 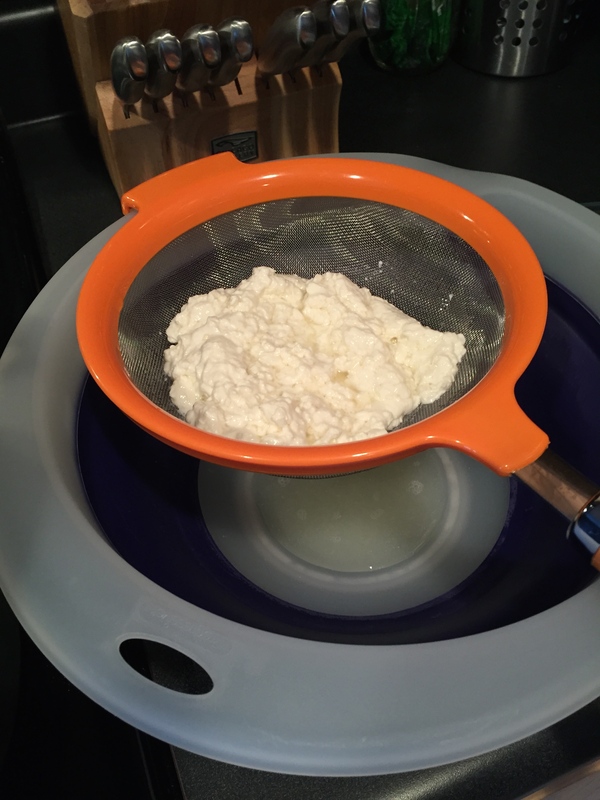 Transfer drained curds to a microwave safe bowl. I ended up doing this in a two-part process to drain off as much whey as I could. 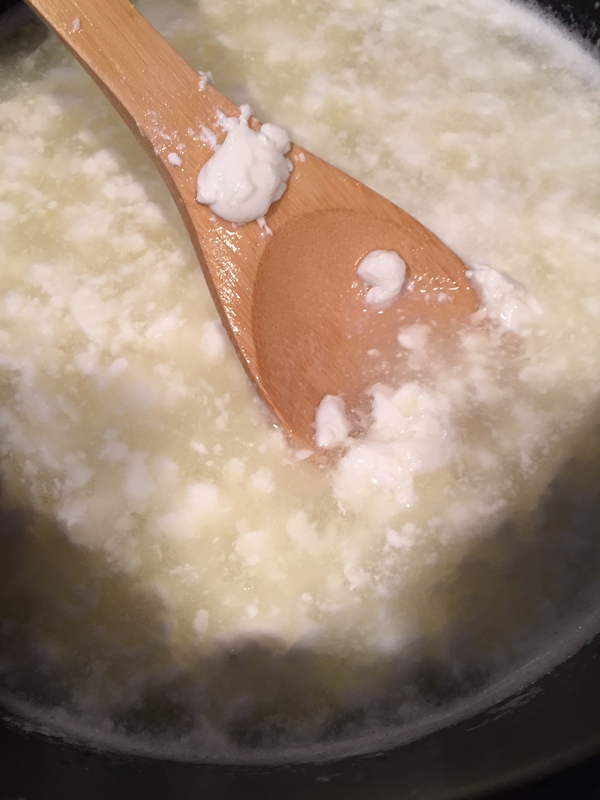 I used a slotted spoon to transfer curds from the pot to a strainer. Then after letting them strain, I transferred them to the microwave safe bowl. 11. Microwave on high for one minute. 12. 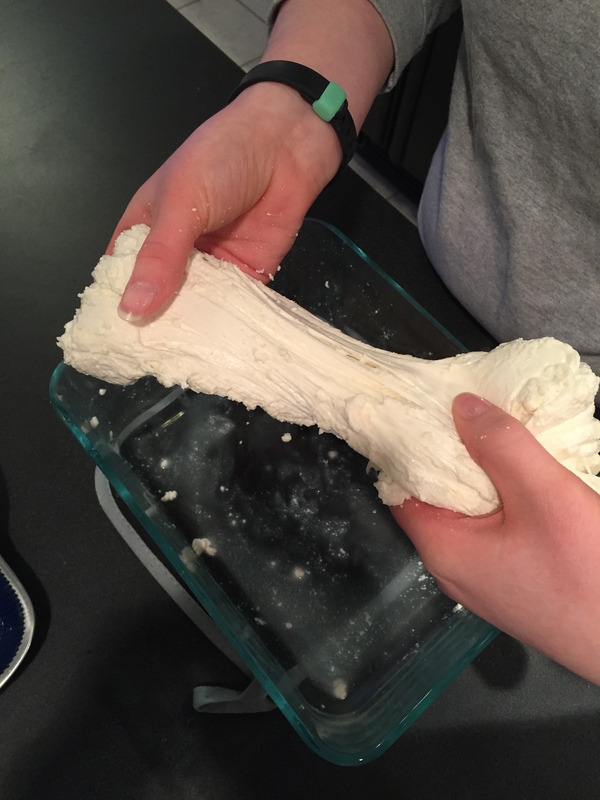 Fold curds into a single “loaf” much like you would knead bread. Add 1 tsp of cheese salt and fold in. 13. 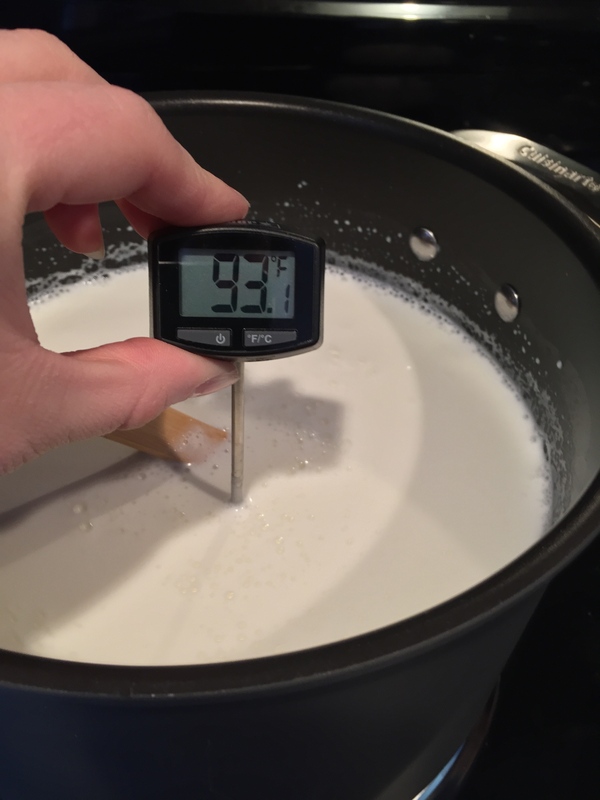 Microwave for an additional 30 seconds or in 30 second increments until curds are heated to 135°F. 14. Stretch cheese as you would taffy. Cheese will become firm and shiny. Caution — rubber gloves would probably be helpful for this step because the cheese is hot! 15. Once cheese is shiny, roll into a ball or log then immerse in 50°F water for 5 minutes. 16. Transfer to an ice bath for an additional 15 minutes. 17. Wrap cheese in saran wrap to seal and refrigerate or use. 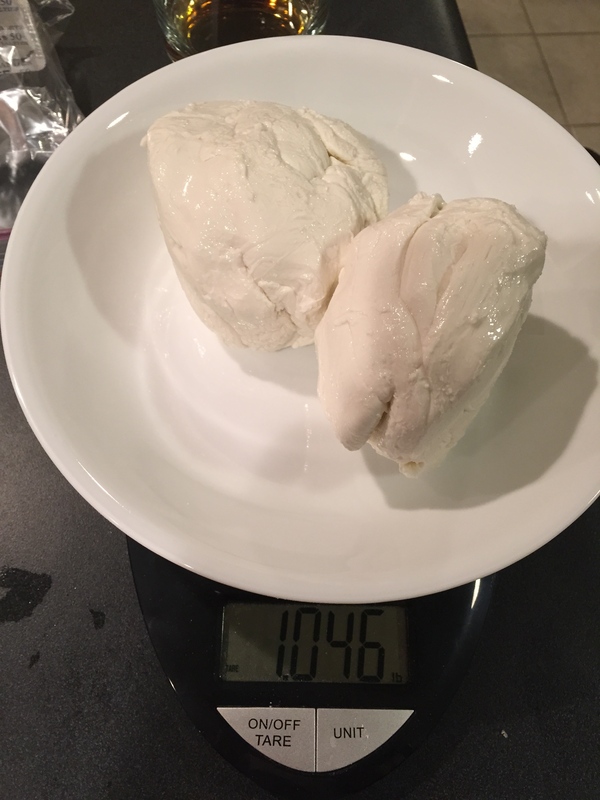 We ended up with slightly over one pound of mozzarella! You also end up with quite a bit of whey. I ended up making some loaves of bread with the leftover whey, but feel free to get creative–there’s tons of things you can do with it! 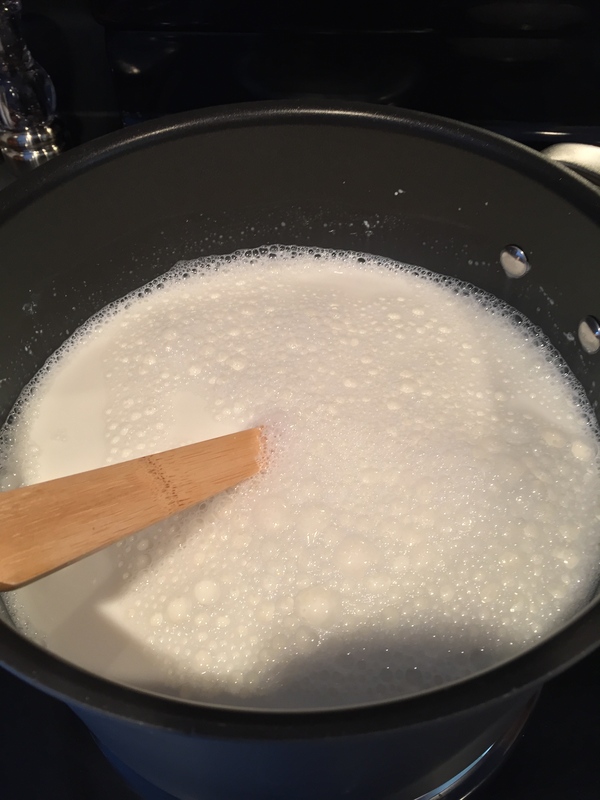 I wanted to figure out the cost per pound of mozzarella, so I did some quick math: The kit includes supplies for 30 batches and costs $25.21, so it’s about $0.84 per batch. A gallon of whole milk is currently about $3.80 in my area. That comes out to $4.64 per batch. 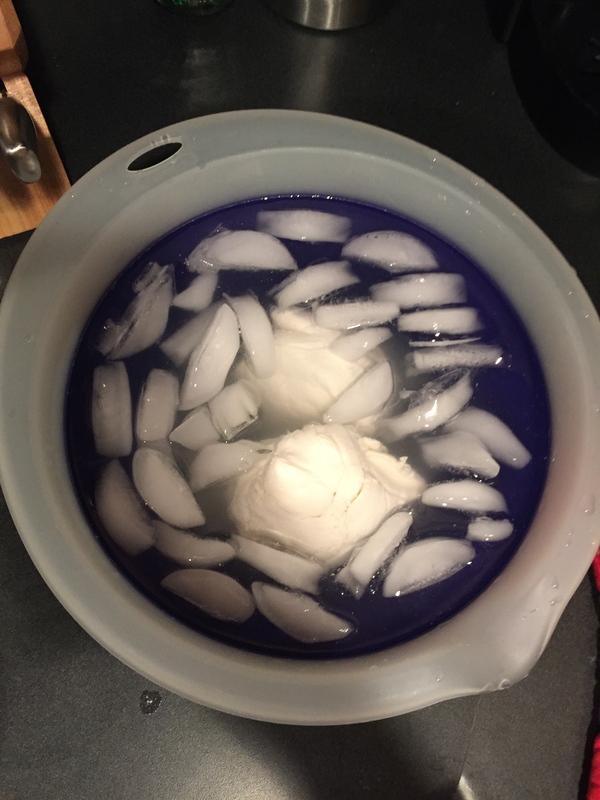 I got 1.05 pounds of mozzarella in a batch, so that’s $4.42 per pound. 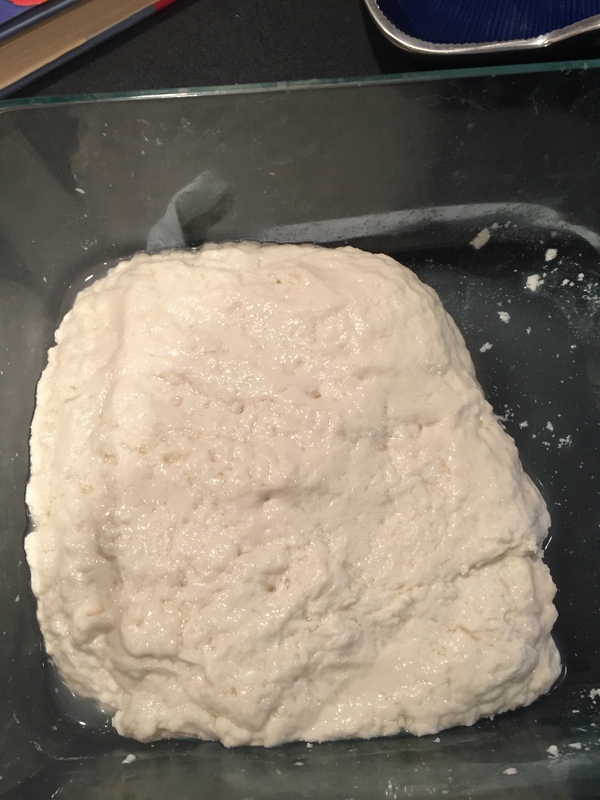 I’ve heard it before, but never really believed it until I tried it myself–homemade mozzarella tastes way better than store bought. This kit made making my own cheese very easy, and I’d definitely recommend it to anyone who wants to try making their own cheese. I can’t wait to try the ricotta recipe next! Have you tried making your own mozzarella? If so, share your experience below. 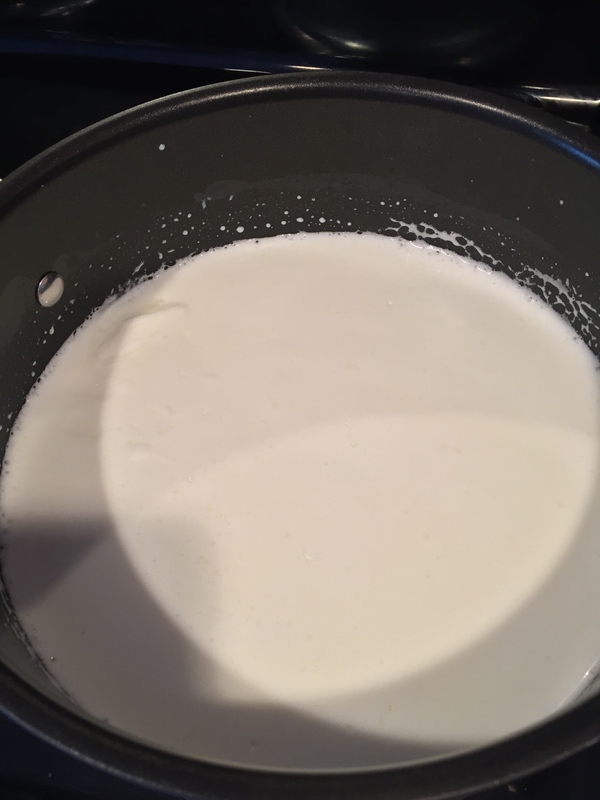 I’m also looking for new ways to use the leftover whey, so share any suggestions below as well!